This is a really easy recipe, just requiring a little patience and time for the different layers to set. Ideal for a summer dinner party to impress without too much effort. The coriander layer adds a little something unusual but is a perfect flavour match to strawberry...honest. You could also try basil or celery as well. I used the OXO Good Grips berry bowl which is quite sweet. 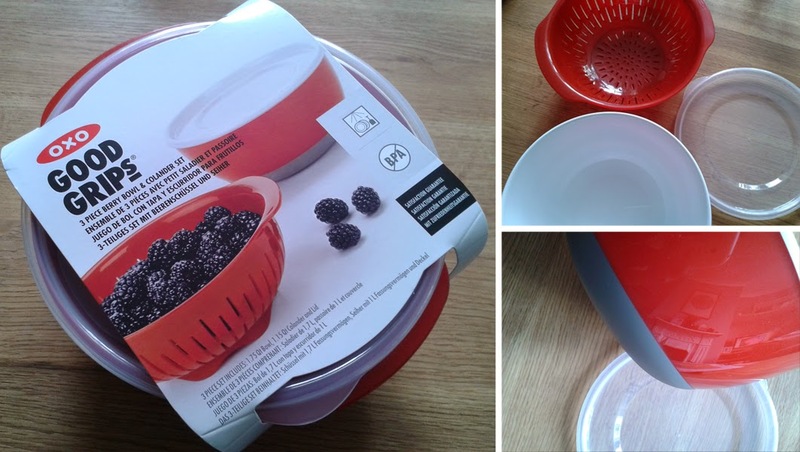 Along with a colander, the set comes with a bowl and lid so you can refrigerate and serve. With a little one in the household I also find it handy to drain small servings of rice, pasta and to wash fruit portions for him and serve in the bowl. It really is a useful little bit of kit. You too can win an OXO Good Grips Berry Bowl Set and Strawberry Huller by leaving me a comment below or emailing me thegraphicfoodie (at) hotmail.com using "Berry Competition" as the subject line. I'll pick one winner at random on 15th July 2014 and they will then go on to be entered into a larger prize draw to win a year's worth of strawberries. I'm guessing the supply will not be delivered all at once! UK entries only. Thanks for all the entries and to Cara the winner! Using a muffin tray and tea towel, angle six glasses, making sure they are quite secure and stable. Make up the fruit jelly layer as per packet instructions and allow to cool to room temperature. Carefully pour into the glasses. It should seem roughly just under half full with jelly (you want the thin coriander jelly layer to make up to half). Allow this to set completely which is important otherwise the layering will not work. This will take roughly 5 hours or overnight. Make up the coriander jelly and once room temperature, pour a thin layer onto the fruit jelly. If still warm then the layers will merge so be patient! Again allow to set completely, roughly 1-2 hours. 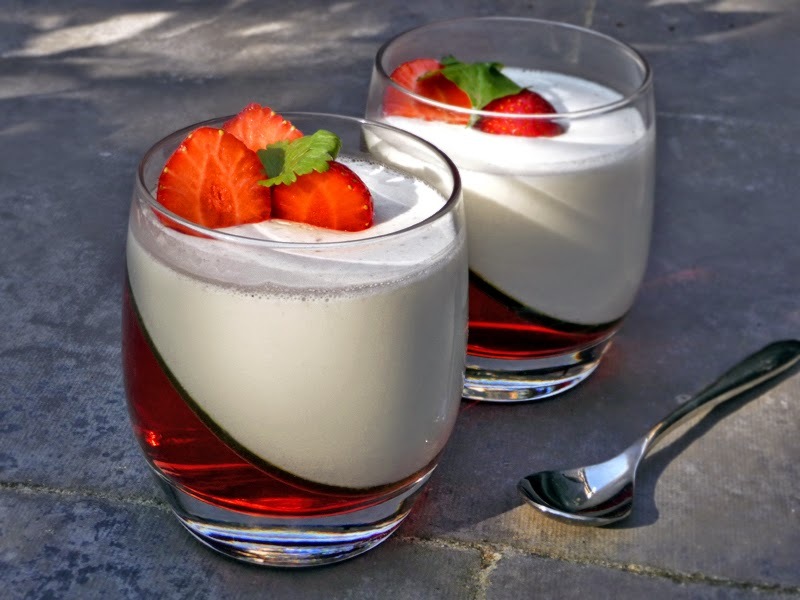 Make the panna cotta recipe and allow to cool. Stand the glasses up straight and pour in the pannacotta to the same top level as the jelly. Allow to set in the fridge for a few hours or overnight. Decorate with more berries just before serving. Make as per packet instructions. Allow to cool to room temperature. Blend the coriander with a little water and pass through a very fine sieve/tea strainer to remove pulp. Pour 3 tablespoons of boiling water in jug. Sprinkle on the gelatine and whisk until completely dissolved. If hasn't dissolved the stand the dish in a pan of hot water. You'll almost certainly have to do this due to the low liquid amounts. Add the sugar and stir again until dissolved. Add the strained coriander juice and make up to 285ml/half pint with cold water. Allow to cool to room temperature. Combine the gelatine and half of the milk in a bowl and leave to absorb for 10 minutes. Place the remaining milk, cream, sugar and vanilla bean and seeds in a saucepan and gently bring to the boil. Remove from the heat, mix in the gelatine mixture and whisk until completely dissolved. Allow to cool to room temperature.